There are currently no more Uucht evenings planned. Our last vigil took place on Wednesday 31st January 2018 at “Vins fins” in Luxembourg Grund. Registration at inecc.lu. In the winter months the days get shorter and the nights get longer. In earlier times, when there was no electricity, people got together on long winter evenings, alternately in different homes, which is called “Uucht” in Luxembourgian. It was all about exchanging news, telling stories, singing songs and tinkering alongside spinning wool, patching clothes, embroidering blankets, smoking a pipe, dozing a while or whatever. This resulted in saving wood and light. We would like to revive this long-forgotten tradition and invite you to “uucht” with us singing songs and telling stories. We sing an international repertoire with secular songs in Luxembourgian, German, French, Portuguese, English and Italian. We will use especially the singing booklet Stimmband – Lieder und songs, published by the German publishing house Reclam. We bring a stock of 25 books to each Uucht. Here are the references in case you wish to buy it: the small pocket book worth € 6.95; the same book is available in large format for € 14.95 (XL-Ausgabe. 13.6 x 21 cm). We accompany the song with piano, acoustic guitar and / or accordion. We tell little stories and anecdotes from different cultural backgrounds, in Luxembourgian, German and French. You may bring your own selection. Everyone is welcome, even if it is not to sing, but to listen and engage in a quiet activity such as spinning, crochet, knit, embroider or just read. Registration is required at inecc.lu, 20 € / person. The bistro is convivial but somewhat confined with 22 seats, so we will limit registration to 22 people. In order to simplify the organization, dinner without drinks is included in the registration fee of 20 euros per person. On the menu: 1. Vegetarian cold plate (various tapas, humus, lentils,…). 2. Cheese board with salad. Please indicate your choice when registering with INECC. 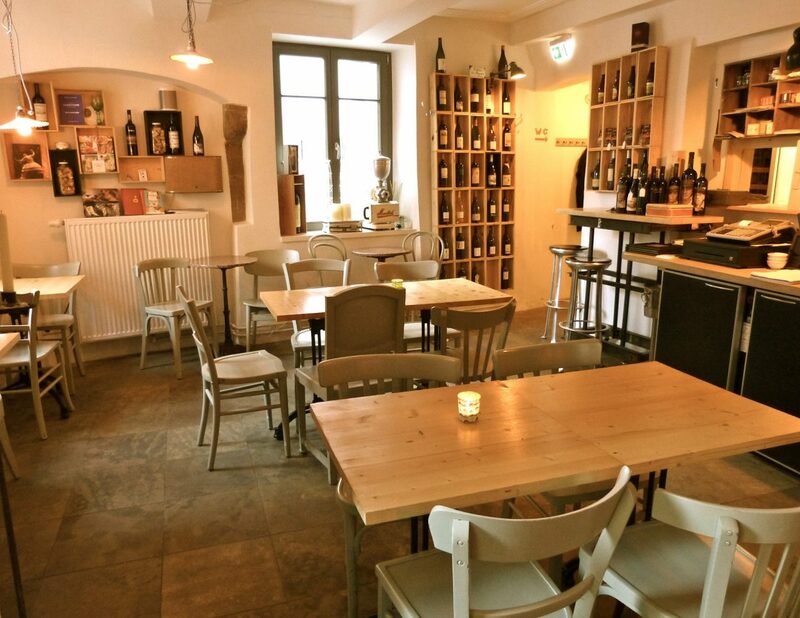 We have our next “Uucht evening” in the cosy bistro Vins fins in Luxembourg-Grund, just across Liquid bar. Candles create a warm atmosphere in this friendly setting and there’s plenty of organic food and drinks.